Rather than cram multiple activities into a single outing, this Puerto Limon shore excursion lets you linger in the Tortuguero Canals—known as Costa Rica’s Amazon for their rich variety of wildlife. 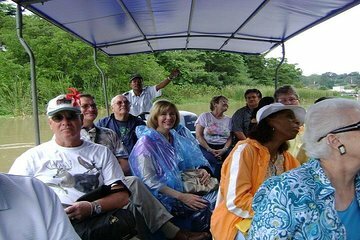 Your guide helps you spot animals like monkeys, toucans, and sloths in the wild as you sail down the canals in an open-sided safari boat, and port pickup and drop-off don’t waste any time getting you between destinations. Guide very knowledgeable. Would be more interesting to learn about the banana plantations and how they operate. We had to ask for a ride through the city. Overall a good tour.